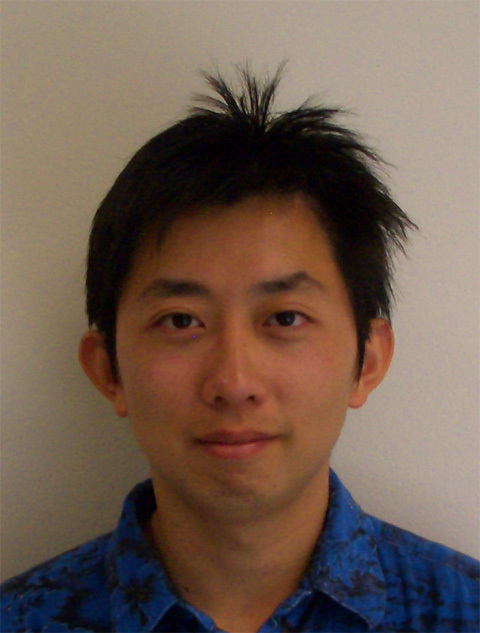 I'm a Ph.D candidate in Computer Science and a member of the Computer Graphics and User Interface Lab. I'm expecting to graduate by the end of 2011. I'm currently developing the Goblin XNA infrastructure, which is a platform for research on 3D user interfaces, including augmented reality and virtual reality, with an emphasis on games. It is written in C# and based on the Microsoft XNA Game Studio 3.1. 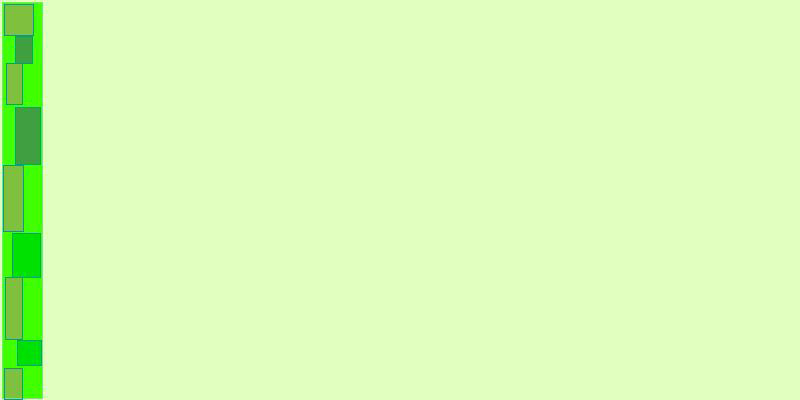 The framework is downloadable from here. I'm broadly interested in applications of mobile augmented reality systems in the field of recreation and entertainment, including virtual sports and gaming. My thesis topic is Multi-user Interaction Techniques in Augmented Reality. I received a B.S. in Computer Engineering and Computer Science from University of Wisconsin Madison and an M.S. in Computer Science from Columbia. 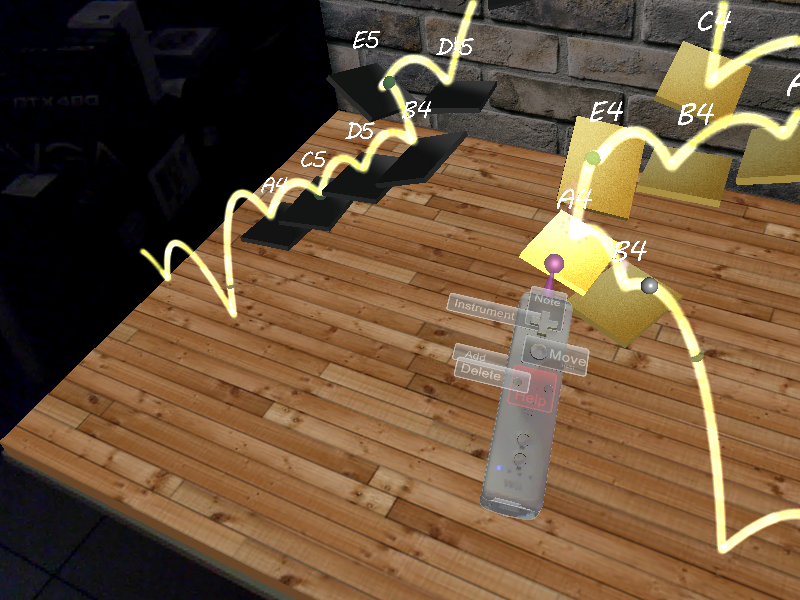 This is a 3D audiovisual augmented reality environment in which players can position and edit virtual bars that play sounds when struck by virtual balls launched under the influence of physics. 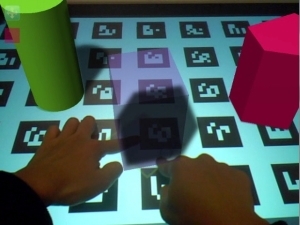 Players experience ARmonica through head-tracked head-worn displays and tracked handheld ultramobile personal computers, and interact through tracked Wii remotes and touch-screen taps. The goal is for players to collaborate in the creation and editing of an evolving sonic environment. Research challenges include supporting walk-up usability without sacrificing deeper functionality. A video is available here. 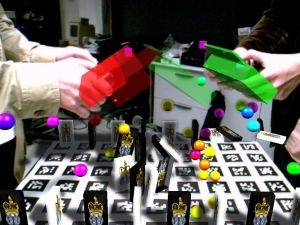 In a multi-user augmented reality application for a shared physical environment, it is possible for users to interfere with each other. For example, consider a multi-player game in which each player holds a display whose tracked position and orientation affect the outcome. In this kind of game, one player may physically block another player's view or physically contact another player. We are exploring software techniques intended to avoid such interference. These techniques modify what a user sees or hears, and what interaction capabilities they have, when their display gets too close to another user's display. Redirected Motion is an effective, yet nondistracting interference avoidance technique for hand-held AR. For details, please read the paper here. A video is available here. The player wears a video-see-through head-worn display, and tilts and translates a tracked board to guide a virtual "marble" (actually, more like a little rubber ball) through a dynamic maze of obstacles. Gravity in the game always points in the correct direction, no matter how the player's head and board are oriented relative to each other. This is possible because the game uses both optical marker tracking and a separate head-tracker built into the head-worn display. The optical marker tracker relies on a camera on the head-worn display to determine the board's relative position and orientation. The built-in head tracker determines which way is "down," which the game uses, in turn, to compute the true "down" direction for the board. A video is available here. This is an augmented reality domino game. It demonstrates an application that can run on a mobile device with reasonable framerates (~30Hz without shadows, ~15Hz with shadows). 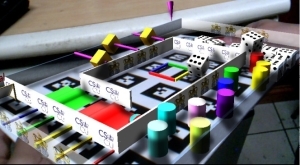 The player can add more dominos to the optically tracked game board, as well as modify the position and orientation of each existing domino. The current goal of the game is to knock all the dominos off the board by shooting balls from wherever the screen is tapped. 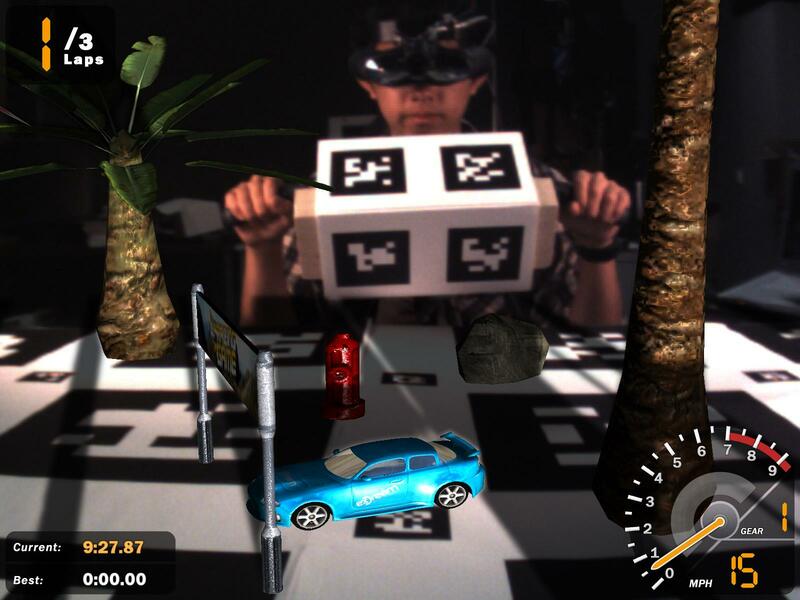 This is an augmented reality mod of the XNA Racing Game Starter Kit. This is the first game being created using Goblin XNA, and demonstrates the use of fiducial tracking, 2.5D and 3D widgets, and assorted 3D user interface techniques. The Goblin XNA AR Racing Game uses an optically tracked physical gameboard, controller, and tokens. Instead of racing around a preset virtual track, the driver must pass a sequence of waypoints, while avoiding obstacles. Waypoints and obstacles are attached to physical tokens that can be moved dynamically during gameplay to rearrange the course. A video is available here. Worked on the implementation of a mobile augmented reality treasure hunt game, as well as a mobile authoring tool for augmented reality. Ohan Oda, Steven Feiner, "Rolling and Shooting: Two Augmented Reality Games", CHI EA '10, Atlanta Georgia USA, 10 - 15 April, 2010. Sinem Guven, Ohan Oda, Mark Podlaseck, Harry Stavropoulos, Sai Kolluri Gopal Pingali, "Social Mobile Augmented Reality for Retail", Percom '09, pp. 1 - 3, 9 - 13 March, 2009.